Your buddy list will soon fill up. It will likely contain friends, family, Mac User Groups Members, and others that you have accumulated. They will not all be on-line at the same time. And so a list of fifty plus names will be off the end of your screen, particularly if you are displaying the Buddy icons. This page looks at the options you have in Displaying and Organizing the Buddy List. There are display options you can use. Click the Buddy List window to make it the front window. Go to the Menu bar and select the View menu. The top item should read "Show Buddy Pictures" with a tick next to it. Select this item to remove the tick. The Buddy icons will disappear and more names will scroll up from out of sight. To a small extent the same applies to Showing the Video and Audio Status icons as they are slightly bigger than the text but there is little to be gained from this and can make it difficult to start Video or Audio chats (Use the Buddies Menu). You now need to use the View menu again and select one of the "Sort By..." options. "Available" will bring the On-line ones to the top, with the Available ones at the very top and the Away ones underneath. If any Buddy is 'Idle' they will appear in between. (Idle is when the computer has not received any input from a connected device like the mouse or keyboard) The names can be sub-ordered alphabetically. See under 3. below. "First" name speaks for itself and they appear alphabetically. "Last" name is the same as "First", except for the name that is used. You can alter the way the name is displayed by putting things like Family as the First name and putting the whole of their name in the Last name field in the Address card (Command/Apple//⌘ key and " i ") This will display all three parts. Such as Family (additional First name entry) Ralph (Normal First name entry) Johns (last Name entry). You can use other characters such as " - " and "(" or ")" to aid your visual recognition. Finally, for this section, you can use a combination of the Sort options to get the List to display as you prefer. For instance using the First name option will display all you Buddies alphabetically. If you then switch to Available they will retain the alphabetical sort as well. You can of course remove Buddies that have not been used in a while. 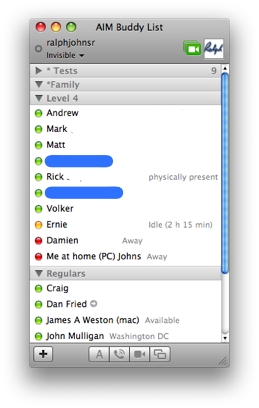 In iChat 3 use the View Menu to Show Off-Line Buddies or even as a separate Off-Line Group to assist with 4. There are three groups as default on iChat. Clicking on the word Groups under your details in the Buddy List and above the Buddies. Both will make a side drawer open from the buddy list. Clicking on the tick box at the top of the drawer will turn the off that main coverall and light up the individual groups. This way you can turn off one groups at a time and see which groups Buddies belong to. Buddies are added to a group by dragging their name from the Buddy list to one of the groups. Adding a buddy to two groups or more will not display them any more times in the Buddy list but will cut down the number of Buddies you can have in total. Hence the reason for checking in the paragraph above. Group names can be changed by clicking on the name of the Group. More Groups can be added by clicking on the + sign at the bottom. Unfortunately you can not sort by Groups. Occasionally, though your "Sort by..." setting will get lost and the View menu will not display a sort by choice. At these times the list will revert to displaying your Buddy List by group. As you can see from this Picture the iChat 3 Buddy list can display the Groups in Tabs. This is done from the View menu in iChat 3 and using or selecting the Show Groups item. If this options is unselected the Buddy list will display as it does in iChat 2 with the Buddies being sorted by the other options, if used, in the View menu. As you can see I have added Special Characters to Sort the list beyond Alphabetically which is the only way they display. 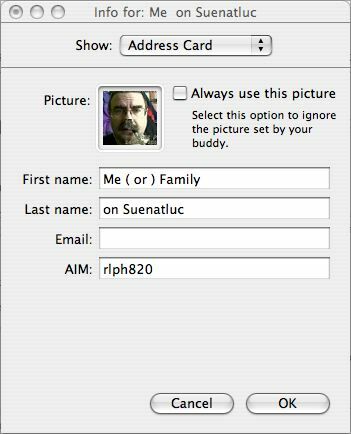 In both versions the Buddy list remains the same comparative size to iChat 2 when the Buddy Pics are displayed. But see "Notes" below. Essentially there are very few reasons at this moment in time to use groups other than to make some things easier for your self. The AdiumX screen shots show you what has be done, by another application, in identifying the different sorts of account types and the varied ways you could use the information. The only way this is likely to change at the moment is by user Feedback. Also in iChat 2.x there is a tendency for new Buddies to be added to all groups. This causes a problem with the number of Buddies you can have. The total was 200. These are counted as the list as a whole - so Buddies in more than one group are counted that many times that they appear. (This is to do with the way AIM displays/counts Buddies rather than the iChat display) See Page 11 for a Fix and the error message you will get. If your Buddy list is really long I would choose the option that allows you to not show off-line buddies. (See View menu). This is more likely to create a short, more viewable list. In addition there is an Add-On called Chax. One of the things it can do is to reduce the Font Size of the Buddy List. Another is colour the Tabs for the group Headers. This really came out for iChat 3 and now has Links to a Download for Leopard/iChat 4 on the Front page with a link to a direct download for Tiger/iChat 3. How to get the Buddy list to have more Names on display if you have lots. It will display shorter if you have less. In iChat 2 this will mean dragging the list shorter. How to use the Sort Options to get the Names to display by Availability or Alphabetically. Don't forget you can remove Buddies as well. Even Blocked ones. Leave them in the Blocked list though. What to do to create groups. How to tweak the Group name to display in a different order using leading Special Characters like " * "
I am not going to mark this whole section in pink. Just to say this section looks at some of the iChat 3 differences in more detail.